Silent movies are unique in that there isn’t any sound except for the soundtrack. The audience is required to pay the utmost attention to the screen and watch the actors carefully convey the emotion and actions that their respective characters are portraying. What’s especially interesting is when a silent film has no inter-titles, or a title card explaining the scene that is unfolding. A Page of Madness has no inter-titles and upon a first showing of the film, you may feel confused as to what is happening. Back when silent movies would play in theaters, there would be a storyteller or benshi present to narrate the story for the audience. 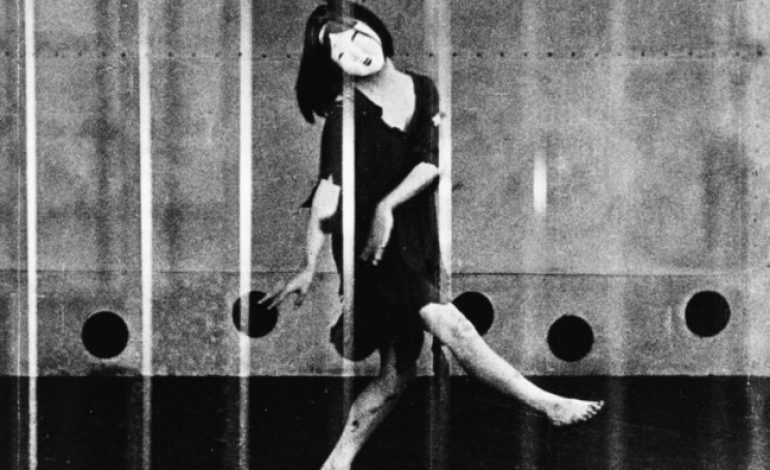 Released in 1926, this Japanese tale tells a unique story and while watching it on the screen, we the audience were treated to a special guest, The Alloy Orchestra who performed during the duration of the film. A Page of Madness (or A Page out of Order was the original title) tells the story of a man who works as a janitor at a mental institution and secretly plans to free his wife who is a patient there. Gathering from the images that we see, we know the man is feeling guilty of something and that his wife is not well. We know that he cares for her and wants to be by her side; however, the hospital staff knows nothing of this. Further complicating everything, the man’s daughter visits the hospital to discover her father working there. She sees her mother who’s locked in a cell and left to fend for herself. It’s sad, depressing and made me realize that this was a different time for the mentally ill. These patients weren’t treated with care like today, they were placed in cells much like a prison setting, not to mention the other patients are insane themselves. I could only imagine that medication to help the mentally ill wasn’t available at this time. Perhaps, they were placed in their cells, or rooms, and left there until they were better — same as with the old-fashioned way of staying in bed until you felt better; No medicine, no help and almost no hope at the end of the road. A Page of Madness is unique in its style. We get fast cuts, a montage-like feel and moments when we aren’t sure what is real and what’s fantasy. I was mesmerized while watching this film because I saw this a horror film in some respects. These patients are sick and are left alone, we get an opening scene of a woman dancing elegantly while a torrential storm is raging outside. Is she remembering something from her past or is her mind elsewhere? I had a series of thoughts racing through my mind especially during the fantasy moments. Is the hospital a good place to be? Will the patients get better? Will the janitor succeed in freeing his wife? Are the patient’s prisoners in the asylum or are we prisoners of our mind? The audience wasn’t sure either as I spotted numerous people who fell asleep. Even during the Q&A, some audience members thought the husband was trying to kill his wife instead of trying to free her. This is a perfect example of widespread confusion with the lack of inter-titles explaining the scenes as they happen. I was confused at certain points myself, but as the movie progressed I felt a wave of fear wash over, wondering not if the wife would be free from the setting where she was, but would she be free from her fractured mind? The director, Teinosuke Kinugasa does a fantastic job of creating this eerie mood throughout. The dark corridors of the hospital, the fractured minds of all the patients and the look of sadness on the janitor’s face are all compelling. The husband did something to his wife, but what? Did he cause her pain? Does he feel guilty of something he did? Is he in some way responsible for his wife’s predicament? There are a lot of questions that will ponder the mind while watching this movie, but one thing is certain, The Alloy Orchestra who performed during the show made the experience even better. They specialize in performing their own accompaniments to silent movies. I wonder what the soundtrack was like when the film was originally released but I enjoyed the music that The Alloy Orchestra performed for us. Music is just like words written on a page or an actor speaking them; they bring mood, setting and paint a picture for what’s happening. For A Page of Madness, the music was intense, sad, moving and painted a picture of madness. I was unable to purchase a copy after the screening, but their other works are something to not pass over. Silent films may be boring for some people because I feel that we’ve been spoiled with talking pictures. Not me — I love them because of how different they are. They make you pay attention more to the characters. It’s not something you should throw on for background noise, no pun intended. In a unique twist of events, A Page of Madness was lost for over forty years when it was rediscovered by the director himself. If you think about it, World War II may be responsible for the loss of numerous silent Japanese films. The sense of style and unique expressionism stands out so much that it reminds me of Fritz Lang’s amazing movie and my personal favorite, Metropolis. The mind is precious and the people we love can be affected in a devastating way. A Page of Madness is scary, unique and introduces us to a world of the insane and one man’s quest to right a wrong. The tone, setting and mood are very memorable to me because I love movies where things get complicated in ways that we don’t expect. The mind is a terrible thing to waste and seeing it become fractured to someone we love is something that is all too real. A Page of Madness explores these ideas and had me on edge the entire time. A worthwhile experience results in the most exciting movie at EbertFest!